TopTennisTips is the #1 service for Tennis Betting Tips with Artificial Intelligence. Using statistics and machine learning we analyze all professional tennis matches and provide recommendations with probability and expected yield assigned to every prediction. If you have a specific purpose, we cover this too: you can experiment with the tools we provide and set filters that suit your needs the best. AI (Machine Learning) helps us to find common patterns in player statistics and can give us the predicted winner as well as a certainty probability too. Tennis is made for betting: only two players compete (in singles) and there are only two outcomes (win or lose). Because less players are involved than in other sports, like football, it's easier to assemble statistics and find patterns with AI. We carefully analyzed 400.000 professional tennis matches of the past and created a Machine Learning model that is able to predict who will win the match with the certainty probability as well. 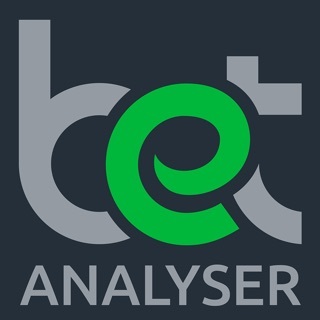 We analyze and predict 200-300 matches daily and automatically identify the best and most profitable tennis tips for you. 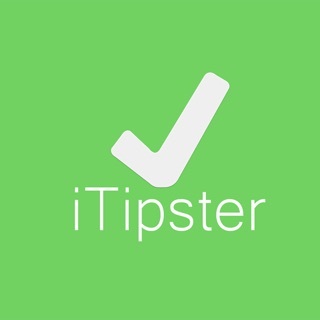 By default the recommended tips are shown only, but you can use our Backtest tool to experiment and set your own filters which will allow you to see the tennis tips you exactly want. 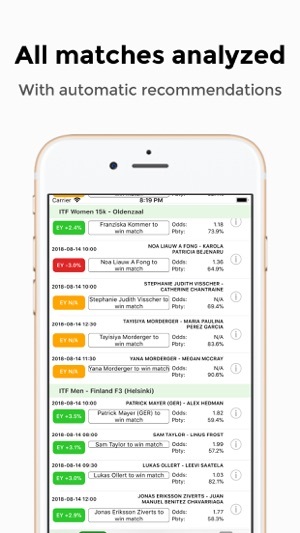 With our tools you'll be able to tailor our tennis predictions for your specific needs. With filter ranges for expected yield, probability and odds for each 6 tournament levels, you'll be able to fine-tune your settings to get the predictions you want. Are you looking for high success rate, good yield or not many ups and down? You'll find the answer at TopTennisTips. We offer daily tennis predictions and probabilities for almost all professional tennis matches. This means about 5000 tennis picks per month for ATP, ATP Challenger, ITF Men, WTA and ITF Women tournaments. We provide our services since 2013 and helped customers in more than 60 countries all over the world. The application is free to download. After signing in, you can see the free tip of the day. All tennis match tips can be unlocked with a paid subscription. Price is detailed in the "Subscription Prices" of the In-App-Purchase (per country). Subscriptions are monthly and automatically renewing unless cancelled 24 hours prior to the end of the current period. Account will be charged for renewal within 24-hours prior to the end of the current period. Payments will be charged to your iTunes Account. Subscriptions may be managed and auto-renewal turned off by going to Account Settings after purchase. See www.toptennistips.com/terms-of-service/ and www.toptennistips.com/privacy-policy/.